Hip lounge at Fashion Island Hotel in Newport Beach featuring outdoor seating, DJs, craft cocktails and small bites. : Fashion Island Hotel in Newport Beach livened up the lobby with Aqua Lounge, which draws crowds of revelers when the DJs are spinning (Thurs. 7 p.m.-12 a.m., Fri.-Sat. 8 p.m.-1 a.m.). (The clubby scene may come as a surprise to hotel guests checking in late at night after a long day of travel, but perhaps they'll be enticed to join the party.) 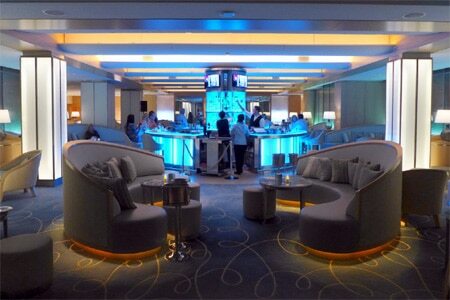 Crescent-shaped booths, which can be reserved at a premium, surround the blue-lit, circular bar. Beyond that is the patio overlooking the pool. A short menu has "bites & shareables" including oysters on the half shell, a cheese and charcuterie spread, and a thin-crust pizza. There's also an after-hours menu available Fri.-Sat. 10 p.m.-midnight, offering a beef taco, buffalo cauliflower bites and The Classic Burger. (Brittany Valles is now the executive chef.) About a dozen wines are available by the glass, plus craft beers on draft and specialty cocktails like the Cucumber Cobbler (sage-infused Hendrick's Gin, green apple and cucumber purée, homemade ginger syrup and lemon juice) and The Millionaire (Duke bourbon whiskey, Cointreau, lemon juice, homemade grenadine and egg white).